Manhattan, New York City, New York, U.S.
Jerome Robbins (October 11, 1918 – July 29, 1998) was an American choreographer, director, dancer, and theater producer who worked in classical ballet, on Broadway, and in films and television. Among his numerous stage productions he worked on were On the Town, Peter Pan, High Button Shoes, The King And I, The Pajama Game, Bells Are Ringing, West Side Story, Gypsy, and Fiddler on the Roof; Robbins was a five time Tony Award winner and a recipient of the Kennedy Center Honors. He received two Academy Awards, including the 1961 Academy Award for Best Director with Robert Wise for West Side Story. A documentary about his life and work, Something to Dance About, featuring excerpts from his journals, archival performance and rehearsal footage, and interviews with Robbins and his colleagues, premiered on PBS in 2009 and won both an Emmy and a Peabody Award the same year. Robbins was born Jerome Wilson Rabinowitz in the Jewish Maternity Hospital at 270 East Broadway on Manhattan's Lower East Side – a neighborhood populated by many immigrants. He was the son of Lena (Rips) and Harry Rabinowitz. The Rabinowitz family lived in a large apartment house at 51 East 97th Street at the northeast corner of Madison Avenue. Known as "Jerry" to those close to him, Robbins was given a middle name that reflected his parents' patriotic enthusiasm for the then-president. In the early 1920s, the Rabinowitz family moved to Weehawken, New Jersey. His father and uncle opened the Comfort Corset Company in Union City, New Jersey. The family had many show business connections, including vaudeville performers and theater owners. In the 1940s, their name was legally changed to Robbins. Robbins began studying modern dance in high school with Alys [CK] Bentley, who encouraged her pupils to improvise steps to music. Said Robbins later: "What [she] gave me immediately was the absolute freedom to make up my own dances without inhibition or doubts." After graduation he went to study chemistry at New York University (NYU) but dropped out after a year for financial reasons, and to pursue dance full-time. He joined the company of Senya Gluck Sandor, a leading exponent of expressionistic modern dance; it was Sandor who recommended that he change his name to Robbins. Sandor also encouraged him to take ballet, which he did with Ella Daganova; in addition he studied Spanish dancing with Helen Veola; Asian dance with Yeichi Nimura; and dance composition with Bessie Schonberg. While a member of Sandor's company Robbins made his stage debut with the Yiddish Art Theater, in a small role in [The Brothers Ashkenazi]. In 1937 Robbins made the first of many appearances as a dancer at Camp Tamiment, a resort in the Poconos known for its weekly Broadway-style revues; he also began dancing in the choruses of such Broadway shows as Great Lady and Keep Off the Grass, both choreographed by George Balanchine. Robbins had also begun creating dances for Tamiment's Revues, some comic (featuring the talents of Imogene Coca and Carol Channing) and some dramatic, topical, and controversial. One such dance, later also performed in New York City at the 92nd Street Y, was Strange Fruit, set to the song performed indelibly by Billie Holiday. In 1940, Robbins joined Ballet Theatre (later known as American Ballet Theatre). From 1941 through 1944, Robbins was a soloist with the company, gaining notice for his Hermes in Helen of Troy, the title role in Petrouchka, the Youth in Agnes de Mille's Three Virgins and a Devil, and Benvolio in Romeo and Juliet; and coming under the influence of the choreographers Michel Fokine, Antony Tudor, and George Balanchine. Robbins created and performed in Fancy Free, a ballet about sailors on liberty, at the Metropolitan Opera as part of the Ballet Theatre season in 1944. One of Fancy Free's inspirations was Paul Cadmus' 1934 painting The Fleet's In! 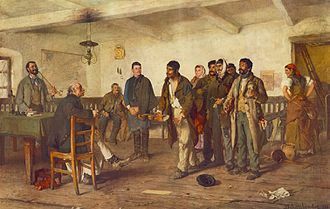 However, Robbins' scenario was more lighthearted than the painting. Robbins said in an interview with The Christian Science Monitor: "After seeing...Fleet's In, which I inwardly rejected though it gave me the idea of doing the ballet, I watched sailors, and girls, too, all over town." Robbins commissioned a score for the ballet from the then-unknown Leonard Bernstein and enlisted Oliver Smith as set designer. With Fancy Free, Robbins created a dance that integrated classic ballet, 1940s social dancing, and a screwball plotline. Later that year, Robbins conceived and choreographed On the Town (1944), a musical partly inspired by Fancy Free, which effectively launched his Broadway career. Bernstein wrote the music and Smith designed the sets. The book and lyrics were by a team that Robbins would work with again, Betty Comden and Adolph Green, and the director was the Broadway legend George Abbott. Because Robbins, as choreographer, insisted that his chorus reflect the racial diversity of a New York City crowd, On the Town broke the color bar on Broadway for the first time. Robbins' next musical was the jazz age fable Billion Dollar Baby (1945), and during rehearsals for the show an incident happened that became a part of Robbins – and Broadway – lore: the choreographer, preoccupied giving directions to the dancers, backed up onstage until he fell into the orchestra pit. Two years later, he received plaudits for his humorous Mack Sennett ballet in High Button Shoes (1947), and won his first Tony Award for choreography. That same year, Robbins would become one of the first members of New York's newly formed Actors Studio, attending classes held by founding member Robert Lewis three times a week, alongside classmates such as Marlon Brando, Maureen Stapleton, Montgomery Clift, Herbert Berghof, Sidney Lumet, and about 20 others. In 1948 he added another credit to his resume, becoming co-director as well as choreographer for Look Ma, I'm Dancin'! ; and the year after that teamed with Irving Berlin to choreograph Miss Liberty. While he was forging a career on Broadway, Robbins continued to work in ballet, creating a string of inventive and stylistically diverse works including Interplay, to a score by Morton Gould, and Facsimile, to music by Leonard Bernstein, a ballet that was banned in Boston [CK]. In 1949 Robbins left Ballet Theatre to join George Balanchine and Lincoln Kirstein's newly formed New York City Ballet as Associate Artistic Director. Soon after that he choreographed The Guests, a ballet about intolerance. At New York City Ballet Robbins distinguished himself immediately as both dancer and choreographer. He was noted for his performances in Balanchine's 1929 "The Prodigal Son" (revived expressly for him), Til Eulenspiegel, and (with Tanaquil LeClercq) Bouree Fantasque, as well as for his own ballets, such as Age of Anxiety, The Cage, Afternoon of a Faun, and The Concert, in all of which LeClercq played leading roles. He continued working on Broadway, as well as, staging dances for Irving Berlin's Call Me Madam, starring Ethel Merman, Rodgers and Hammerstein's The King and I, in which he created the celebrated "Small House of Uncle Thomas" ballet in addition to other dances, and the revue Two's Company, starring Bette Davis. He also performed uncredited show doctoring on the musicals A Tree Grows in Brooklyn (1951), Wish You Were Here (1952), Wonderful Town (1953), and choreographed and directed several sketches for the Ford 50th Anniversary Show, starring Mary Martin and Ethel Merman on CBS. In 1954, Robbins collaborated with George Abbott on The Pajama Game (1954), which launched the career of Shirley MacLaine, and created, choreographed, and directed the Mary Martin vehicle, Peter Pan (which he re-staged for an Emmy Award winning television special in 1955, earning himself a nomination for best choreography). He also directed and co-choreographed (with Bob Fosse) Bells Are Ringing (1956), starring Judy Holliday. Robbins recreated his stage dances for The King and I for the 1956 film version. In 1957, he conceived, choreographed, and directed West Side Story. West Side Story is a contemporary version of Romeo and Juliet, set in Hell's Kitchen. The show, with music by Leonard Bernstein, marked the first collaboration between Robbins and Stephen Sondheim, who wrote the lyrics, as well as Arthur Laurents, who wrote the book. Because book, music, and dance were envisioned as an organic whole, the cast, in a Broadway first, had to be equally skilled as actors, singers, and dancers. 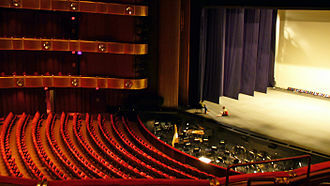 To help the young cast grow into their roles, Robbins did not allow those playing members of opposite gangs (Jets and Sharks) to mix during the rehearsal process. He also, according to dancer Linda Talcott Lee, "played psychological games" with the cast: "And he would plant rumors among one gang about the other, so they really hated each other." Although it opened to good reviews, it was overshadowed by Meredith Willson's The Music Man at that year's Tony Awards. West Side Story did, however, earn Robbins his second Tony Award for choreography. The streak of hits continued with Gypsy (1959), starring Ethel Merman. Robbins re-teamed with Sondheim and Laurents, and the music was by Jule Styne. 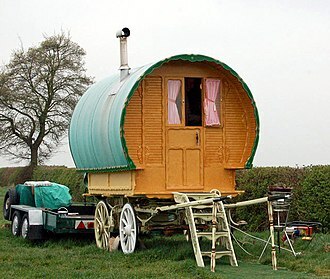 The musical is based (loosely) on the life of stripper Gypsy Rose Lee. In 1956 Robbins' muse, Tanaquil LeClercq, contracted polio and was paralyzed; for the next decade Robbins largely withdrew from his activities at New York City Ballet, but he established his own small dance company, Ballets USA, which premiered at the inaugural season of Gian Carlo Menotti's Festival of the Two Worlds in Spoleto, Italy in June 1958, toured Europe and the US under the auspices of the State Department, and appeared on television on The Ed Sullivan Show. Among the dances he created for it were N.Y. Export: Opus Jazz and Moves. In 1950, Robbins was called to testify before the House Committee on Un-American Activities (HUAC), suspected of Communist sympathies. Robbins, though willing to confess to past party membership, resisted naming names of others with similar political connections; he held out for three years until, according to two family members in whom he confided, he was threatened with public exposure of his homosexuality. Robbins named the names of persons he said were Communists, including actors Lloyd Gough and Elliot Sullivan, dance critic Edna Ocko, Madeline Lee Gilford, filmmaker Lionel Berman and playwright Jerome Chodorov and his brother Edward Chodorov. Because he cooperated with HUAC, Robbins's career did not visibly suffer and he was not blacklisted. In 1961, Robbins directed, with Robert Wise, the movie version of West Side Story. He was fired from the production as soon as principal photography was complete. However, when the film received 10 Academy Awards, Robbins won two, one for his Direction and one for "Brilliant Achievements in the Art of Choreography on Film." In 1962, Robbins directed Arthur Kopit's non-musical play Oh Dad, Poor Dad, Mamma's Hung You in the Closet and I'm Feelin' So Sad. The production ran over a year off-Broadway and was transferred to Broadway for a short run in 1963, after which Robbins directed Anne Bancroft in a revival of Bertolt Brecht's Mother Courage and Her Children. Robbins was still highly sought after as a show doctor. He took over the direction of two troubled productions during this period and helped turn them into successes. In 1962, he saved A Funny Thing Happened on the Way to the Forum (1962), a musical farce starring Zero Mostel, Jack Gilford, David Burns, and John Carradine. The production, with book by Burt Shevelove and Larry Gelbart, and score by Stephen Sondheim, was not working. Robbins staged an entirely new opening number which explained to the audience what was to follow, and the show played successfully from then on. 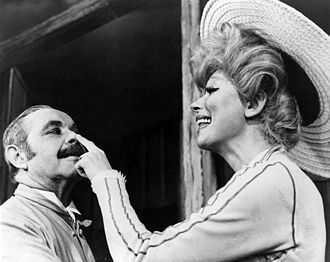 In 1964, he took on a floundering Funny Girl and devised a show that ran 1348 performances. The musical helped turn lead Barbra Streisand into a superstar. That same year, Robbins won Tony Awards for his direction and choreography in Fiddler on the Roof (1964). The show starred Zero Mostel as Tevye and ran for 3242 performances, setting the record (since surpassed) for longest-running Broadway show. 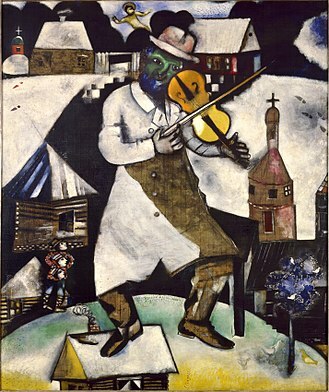 The plot, about Jews living in Russia near the beginning of the 20th century, allowed Robbins to return to his religious roots. He continued to choreograph and stage productions for both the Joffrey Ballet and the New York City Ballet into the 1970s. Robbins became ballet master of the New York City Ballet in 1972 and worked almost exclusively in classical dance throughout the next decade, pausing only to stage revivals of West Side Story (1980) and Fiddler on the Roof (1981). In 1981, his Chamber Dance Company toured the People's Republic of China. The 1980s saw an increased presence on TV as NBC aired Live From Studio 8H: An Evening of Jerome Robbins' Ballets with members of the New York City Ballet, and a retrospective of Robbins's choreography aired on PBS in a 1986 installment of Dance in America. The latter led to his creating the anthology show Jerome Robbins' Broadway in 1989 which recreated the most successful production numbers from his 50-plus year career. Starring Jason Alexander as the narrator (a performance that would win Alexander a Tony), the show included stagings of cut numbers like Irving Berlin's Mr. Monotony and well-known ones like the "Tradition" number from Fiddler on the Roof. 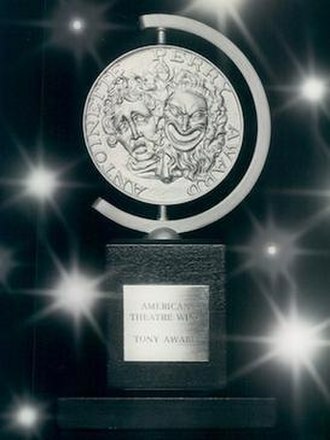 He was awarded a fifth Tony Award for it. Following a bicycle accident in 1990 and heart-valve surgery in 1994, in 1996 he began showing signs of a form of Parkinson's disease, and his hearing was quickly deteriorating. He nevertheless staged Les Noces for City Ballet in 1998, his last project. Robbins suffered a stroke in July 1998, two months after the premiere of his re-staging of Les Noces. He died at his home in New York on July 29, 1998. On the evening of his death, the lights of Broadway were dimmed for a moment in tribute. He was cremated and his ashes were scattered on the Atlantic Ocean. 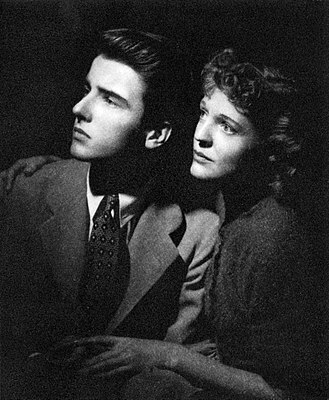 Robbins had relationships with a number of people, from Montgomery Clift and Nora Kaye to Buzz Miller and Jess Gerstein. He never married. Robbins shared the Best Director Oscar with Robert Wise for the film version of West Side Story (1961). 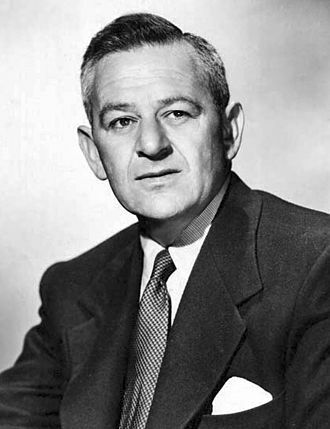 Robbins was only the second director to win the Academy Award for Best Director for a film debut (after Delbert Mann for Marty). That same year, the Academy of Motion Picture Arts and Sciences honored him with a special award for his choreographic achievements on film. In all, he was awarded with five Tony Awards, two Academy Awards, the Kennedy Center Honors (1981), the National Medal of Arts (1988), the French Legion of Honor, and an Honorary Membership in the American Academy and Institute of Arts and Letters. He was awarded three honorary doctorates including an Honorary Doctor of Humane Letters in 1980 from the City University of New York and an Honorary Doctor of Fine Arts from New York University in 1985. 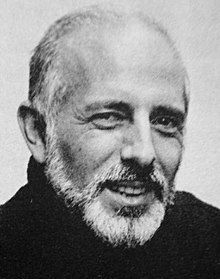 Jerome Robbins was inducted into the American Theater Hall of Fame in 1979. Robbins was inducted into the National Museum of Dance's Mr. & Mrs. Cornelius Vanderbilt Whitney Hall of Fame 10 years later, in 1989. In 1995, Jerome Robbins instructed the directors of his foundation to establish a prize for "some really greatly outstanding person or art institution. The prizes should "lean toward the arts of dance ..." The first two Jerome Robbins Awards were bestowed in 2003, to New York City Ballet and to lighting designer Jennifer Tipton. 1939 Stars In Your Eyes – musical – performer in the role of "Gentleman of the Ballet"
1941 Giselle – ballet – dancer in the role of a "Peasant"
1941 Three Virgins and a Devil – ballet to the music of Ottorino Respighi, dancer in the role of the "Youth"
1941 Gala Performance – ballet to the music of Serge Prokofiev – dancer in the role of an "Attendant Cavalier"
Lawrence, Greg (2001). Dance with Demons: The Life of Jerome Robbins. G.P. Putnam's Sons. ISBN 0-399-14652-0. OCLC 45015298. Jowitt, Deborah (2005). Jerome Robbins: His Life, His Theater, His Dance. Simon & Schuster. ISBN 978-0-684-86986-5. Vaill, Amanda (2006). Somewhere: The Life of Jerome Robbins. Broadway. ISBN 978-0-7679-0420-9. Altman, Richard (1971). The Making of a Musical: Fiddler on the Roof. Crown Publishers. ^ Fick, David (November 12, 2008). "Something to dance about: new Jerome Robbins documentary". Musical Cyberspace. Retrieved 2014-02-25. ^ 69th Annual Peabody Awards, May 2010. ^ Kisselgoff, Anna (July 30, 1998). "Jerome Robbins, 79, Is Dead; Giant of Ballet and Broadway". The New York Times. Retrieved 2014-02-25. ^ Paul R. Laird and David Schiff. "Bernstein, Leonard." Grove Music Online. Oxford Music Online. Oxford University Press. Web. 14 Aug. 2014. <http://www.oxfordmusiconline.com/subscriber/article/grove/music/A2223796>. ^ Green, Jesse (March 15, 2009). "When You're a Shark You're a Shark All the Way". New York. Retrieved 2014-02-25. ^ Lewis, Robert (1996). "The Actors Studio, 1947". Slings and Arrows: Theater in My Life. New York: Applause Books. p. 183. ISBN 1-55783-244-7. Retrieved 2014-02-25. At the end of the summer, on Gadget's return from Hollywood, we settled the roster of actors for our two classes in what we called the Actors Studio - using the word 'studio' as we had when we named our workshop in the Group, the Group Theatre Studio... My group, meeting three times a week, consisted of Marlon Brando, Montgomery Clift, Maureen Stapleton, Eli Wallach, Mildred Dunnock, Jerome Robbins, Herbert Berghof, Tom Ewell, John Forsythe, Anne Jackson, Sidney Lumet, Kevin McCarthy, Karl Malden, E.G. Marshall, Patricia Neal, Beatrice Straight, David Wayne, and - well, I don't want to drop names, so I'll stop there. In all, there were about fifty. ^ Gihring, Tim; Scott, Gregory J. (July 2011). "July 2011 Arts Calendar". Minnesota Monthly. Greenspring Media Group Inc. Retrieved 2014-02-25. ^ Vaill, Amanda (January 27, 2009). "Jerome Robbins-About the Artist". American Masters. PBS. Retrieved 2014-02-25. ^ a b Vaill, Amanda (May 6, 2008). Somewhere: The Life of Jerome Robbins. New York: Broadway Books. ISBN 978-0767904216. ^ "About Jerome Robbins: Awards & Honors". JeromeRobbins.org. Retrieved 2014-02-25. ^ "Jerome Robbins Award". Jerome Robbins Foundation. Archived from the original on October 20, 2014. Retrieved February 27, 2014. ^ B, Peter (17 October 2017). "NYCB Chronological history of repetory". www.nycballet.com. ^ "Jerome Robbins Catalog of Work: The Four Seasons". Jerome Robbins. Retrieved February 17, 2018. ^ B, P (2017). "NYCB complete repertory". The Atlantic Ocean is the second largest of the worlds oceans with a total area of about 106,460,000 square kilometres. 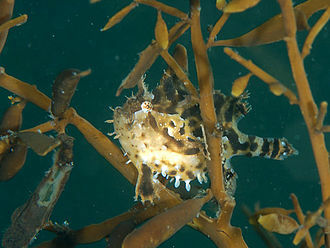 It covers approximately 20 percent of the Earths surface and about 29 percent of its surface area. It separates the Old World from the New World, the Atlantic Ocean occupies an elongated, S-shaped basin extending longitudinally between Eurasia and Africa to the east, and the Americas to the west. The Equatorial Counter Current subdivides it into the North Atlantic Ocean, in contrast, the term Atlantic originally referred specifically to the Atlas Mountains in Morocco and the sea off the Strait of Gibraltar and the North African coast. The Greek word thalassa has been reused by scientists for the huge Panthalassa ocean that surrounded the supercontinent Pangaea hundreds of years ago. The term Aethiopian Ocean, derived from Ancient Ethiopia, was applied to the Southern Atlantic as late as the mid-19th century, many Irish or British people refer to the United States and Canada as across the pond, and vice versa. The Black Atlantic refers to the role of ocean in shaping black peoples history. 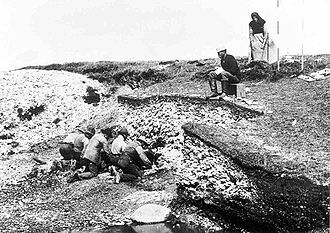 Irish migration to the US is meant when the term The Green Atlantic is used, the term Red Atlantic has been used in reference to the Marxian concept of an Atlantic working class, as well as to the Atlantic experience of indigenous Americans. Correspondingly, the extent and number of oceans and seas varies, the Atlantic Ocean is bounded on the west by North and South America. It connects to the Arctic Ocean through the Denmark Strait, Greenland Sea, Norwegian Sea, to the east, the boundaries of the ocean proper are Europe, the Strait of Gibraltar and Africa. In the southeast, the Atlantic merges into the Indian Ocean, the 20° East meridian, running south from Cape Agulhas to Antarctica defines its border. In the 1953 definition it extends south to Antarctica, while in maps it is bounded at the 60° parallel by the Southern Ocean, the Atlantic has irregular coasts indented by numerous bays and seas. Including these marginal seas the coast line of the Atlantic measures 111,866 km compared to 135,663 km for the Pacific. The Academy Award for Best Director is an award presented annually by the Academy of Motion Picture Arts and Sciences. 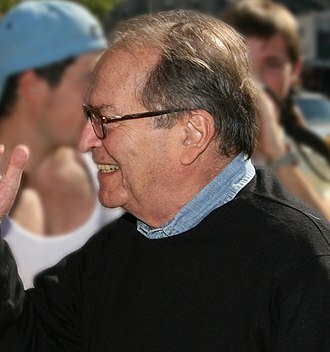 It is given in honor of a director who has exhibited outstanding directing while working in the film industry. However, these categories were merged for all subsequent ceremonies, nominees are determined by single transferable vote within the directors branch of AMPAS, winners are selected by a plurality vote from the entire eligible voting members of the Academy. For the first eleven years of the Academy Awards, directors were allowed to be nominated for multiple films in the same year, the Academy Awards for Best Director and Best Picture have been very closely linked throughout their history. Of the 89 films that have been awarded Best Picture,63 have been awarded Best Director, since its inception, the award has been given to 69 directors or directing teams. John Ford has received the most awards in this category with four, william Wyler was nominated on twelve occasions, more than any other individual. The King and I is the fifth musical by the team of composer Richard Rodgers and dramatist Oscar Hammerstein II. It is based on Margaret Landons novel and the King of Siam, the musicals plot relates the experiences of Anna, a British schoolteacher hired as part of the Kings drive to modernize his country. The relationship between the King and Anna is marked by conflict through much of the piece, as well as by a love to which neither can admit, the musical premiered on March 29,1951, at Broadways St. James Theatre. It ran for three years, making it the fourth longest-running Broadway musical in history at the time, and has had many tours. In 1950, theatrical attorney Fanny Holtzmann was looking for a part for her client, Holtzmann realized that Landons book would provide an ideal vehicle and contacted Rodgers and Hammerstein, who were initially reluctant but agreed to write the musical. The pair initially sought Rex Harrison to play the part of the King, a role he had played in the 1946 film made from Landons book. They settled on the actor and television director Yul Brynner. The musical was an hit, winning Tony Awards for Best Musical, Best Actress. Lawrence died unexpectedly of cancer a year and a half after the opening, a hit London run and U. S. national tour followed, together with a 1956 film for which Brynner won an Academy Award, and the musical was recorded several times. In revivals, Brynner came to dominate his role and the musical, Christopher Renshaw directed major revivals on Broadway, winning the Tony Award for Best Revival, and in the West End. A2015 Broadway revival won another Tony for Best Revival, both professional and amateur revivals of The King and I continue to be staged regularly throughout the English-speaking world. Mongkut, King of Siam, was about 57 years old in 1861 and he had lived half his life as a Buddhist monk, was an able scholar, and founded a new order of Buddhism and a temple in Bangkok. Through his decades of devotion, Mongkut acquired an ascetic lifestyle, when Nangklao died in 1850, Mongkut became king. Imogene Coca was an American comic actress best known for her role opposite Sid Caesar on Your Show of Shows. Starting out in vaudeville as a acrobat, she studied ballet and wished to have a serious career in music and dance, graduating to decades of stage musical revues, cabaret. In her 40s, she began a career as a comedian on television, starring in six series. She was nominated for five Emmy awards for Your Show of Shows, winning Best Actress in 1951, Coca was nominated for a Tony Award in 1978 for On the Twentieth Century and received a sixth Emmy nomination at the age of 80 for an episode of Moonlighting. Miss Coca, on the hand, is the timid woman who. In a 1999 interview, Robert Ozn said during the shoot she was required to sit on the sidewalk in snow for hours during a blizzard with 15 degree temperatures. While the rest of us 20-somethings were moaning about the weather, warming ourselves by a heater and she was the most professional artist Ive ever worked with. Born Emogeane Coca in Philadelphia, Coca was the daughter of Joseph Fernandez Coca, a violinist and vaudeville orchestra conductor and Sadie Brady, Cocas father was of Spanish descent, the son of Joseph F.
Coca, Sr. and his wife, Laura. Coca took lessons in piano and voice as a child and she got her first job in the chorus of the Broadway musical When You Smile, and became a headliner in Manhattan nightclubs with music arranged by her first husband, Robert Burton. She gained prominence when she began to combine music with comedy, a well-received part of her act was a comic striptease, during which Coca made sultry faces and gestures but would manage to remove only one glove. Both of these comedies were filmed in New York, the 90-minute show was aired live on NBC every Saturday night in prime time. She won the second-ever Primetime Emmy Award for Outstanding Lead Actress in a Comedy Series in 1951 and was nominated for four other Emmys for her work in the show and she won a 1953 Peabody Award for excellence in broadcasting. Her success in that program earned her her own series, The Imogene Coca Show, prior to working with Caesar she had starred in an early ABC series, Buzzy Wuzzy, which lasted four episodes in 1948. The various category winners are awarded a copy of a golden statuette, officially called the Academy Award of Merit, which has become commonly known by its nickname Oscar. The awards, first presented in 1929 at the Hollywood Roosevelt Hotel, are overseen by AMPAS, the awards ceremony was first broadcast on radio in 1930 and televised for the first time in 1953. It is now live in more than 200 countries and can be streamed live online. The Academy Awards ceremony is the oldest worldwide entertainment awards ceremony and its equivalents – the Emmy Awards for television, the Tony Awards for theater, and the Grammy Awards for music and recording – are modeled after the Academy Awards. The 89th Academy Awards ceremony, honoring the best films of 2016, were held on February 26,2017, at the Dolby Theatre, in Los Angeles, the ceremony was hosted by Jimmy Kimmel and was broadcast on ABC. A total of 3,048 Oscars have been awarded from the inception of the award through the 88th, the first Academy Awards presentation was held on May 16,1929, at a private dinner function at the Hollywood Roosevelt Hotel with an audience of about 270 people. The post-awards party was held at the Mayfair Hotel, the cost of guest tickets for that nights ceremony was $5. Fifteen statuettes were awarded, honoring artists and other participants in the industry of the time. The ceremony ran for 15 minutes, winners were announced to media three months earlier, that was changed for the second ceremony in 1930. Since then, for the rest of the first decade, the results were given to newspapers for publication at 11,00 pm on the night of the awards. The first Best Actor awarded was Emil Jannings, for his performances in The Last Command and he had to return to Europe before the ceremony, so the Academy agreed to give him the prize earlier, this made him the first Academy Award winner in history. 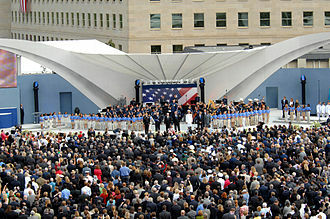 With the fourth ceremony, the system changed, for the first six ceremonies, the eligibility period spanned two calendar years. At the 29th ceremony, held on March 27,1957, until then, foreign-language films had been honored with the Special Achievement Award. The 74th Academy Awards, held in 2002, presented the first Academy Award for Best Animated Feature, since 1973, all Academy Awards ceremonies always end with the Academy Award for Best Picture. High Button Shoes is a musical with music by Jule Styne, lyrics by Sammy Cahn and book by George Abbott and Stephen Longstreet. It was based on the semi-autobiographical 1946 novel The Sisters Liked Them Handsome by Longstreet, the story concerns the comic entanglements of the Longstreet family with two con men in Atlantic City. The musical opened on Broadway in 1947, on the West End in 1948, many involved with High Button Shoes were Broadway first-timers or relatively unknown, except for the director, George Abbott. The designers Oliver Smith and Miles White and choreographer Jerome Robbins were all Broadway veterans, rumors circulated that the book by Longstreet was hopeless and that Abbott and Silvers were heavily rewriting it. The Shuberts, involved because the show was to play in one of their theaters, historian Ken Mandelbaum agrees that the shows book was originally by Longstreet but that it was extensively rewritten by Abbott. The duos dubious intentions are clear as Floy pitches snake-oil schemes including selling fake watches and diamond mines. They are chased by the police, and the scheme is repeated. 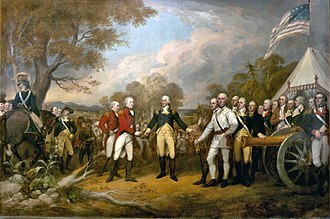 After they cheat the Longstreets in a land deal and Pontdue try to escape to Atlantic City, New Jersey with their ill-gotten profits. As the con men Floy and Pontdue are pursued to the Atlantic City beach while carrying a full of stolen money. They tangle with a number of people—including bathing beauties, other criminals. The climax occurs when the Keystone Cops arrive, and Floy loses everything when he bets on the football team. But after his being captured we learn that Pontdue has bet on not a football team, Floy gives the conned citizens their money back, but before he leaves tries to get the audience to buy one more item of great worth. The highlight of the production was a long ensemble dance number at the beginning of the second act. Choreographer Robbins staged this number in the manner of a Mack Sennett silent slapstick film and it uses the music of On A Sunday By the Sea, Liszts Second Hungarian Rhapsody, and Offenbachs can-can from Orpheus in the Underworld. The Lower East Side is roughly bounded by the Bowery to the west, East Houston Street to the north, the F. D. R. Drive to the east and Canal Street to the south, the western boundary below Grand Street veers east off of the Bowery to approximately Essex Street. The neighborhood is bordered in the south and west by Chinatown – which extends north to roughly Grand Street, in the west by Nolita and in the north by the East Village. 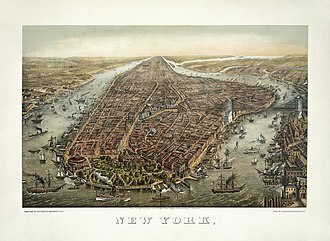 Historically, the Lower East Side referred to the area alongside the East River from about the Manhattan Bridge and Canal Street up to 14th Street and it included areas known today as East Village, Alphabet City, Bowery, Little Italy, and NoLIta. Parts of the East Village are still known as Loisaida, a Latino pronunciation of Lower East Side, Avenue C is known directly as Loisaida and is home to the Loisaida Festival every summer. 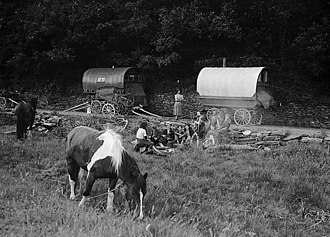 Their main trail took approximately the route of Broadway, one encampment in the Lower East Side area, near Corlears Hook was called Rechtauck or Naghtogack. Around these farms were a number of enclaves of free or half-free Africans, one of the largest of these was located along the modern Bowery between Prince Street and Astor Place. These black farmers were some of the earliest settlers of the area, during the 17th century, there was an overall consolidation of the boweries and farms into larger parcels, and much of the Lower East side was part of the Delancy farm. James Delanceys pre-Revolutionary farm east of post road leading from the city survives in the names Delancey Street, on the modern map of Manhattan, the Delancey farm is represented in the grid of streets from Division Street north to Houston Street. In response to the pressures of a city, Delancey began to survey streets in the southern part of the West Farm in the 1760s. 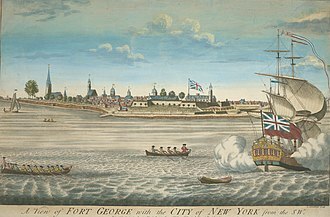 The point of land on the East River now called Corlears Hook was called Corlaers Hook under Dutch and British rule, and briefly Crown Point during British occupation in the Revolution. 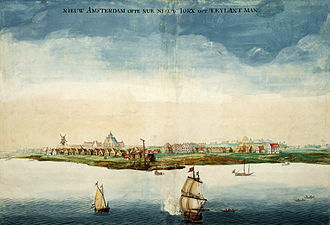 It was named after the schoolmaster Jacobus van Corlaer, who settled on this plantation that in 1638 was called by a Europeanized version of its Lenape name, Nechtans or Nechtanc. 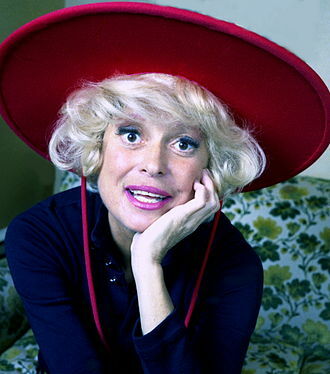 Carol Elaine Channing is an American actress, dancer and voice artist. Notable for starring in Broadway and film musicals, her characters typically radiate a fervent expressiveness and an easily identifiable voice, whether singing or for comedic effect. She began as a Broadway musical actress, starring in Gentlemen Prefer Blondes in 1949, and Hello, Dolly. in 1964 and she revived both roles several times throughout her career, most recently playing Dolly in 1995. 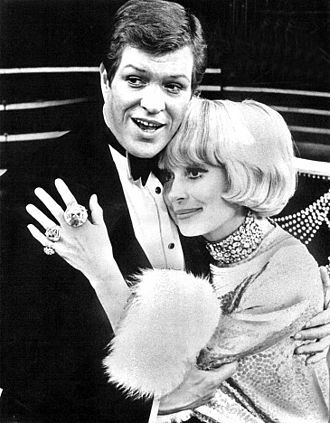 Channing was nominated for her first Tony Award in 1956 for The Vamp followed by a nomination in 1961 for Show Girl and she received her fourth Tony Award nomination for the musical Lorelei in 1974. As a film actress, she won the Golden Globe Award and was nominated for the Academy Award for Best Supporting Actress for her performance as Muzzy in Thoroughly Modern Millie, other film appearances include The First Traveling Saleslady and Skidoo. On television, she appeared as an entertainer on variety shows and she had a standout performance as The White Queen in the TV production of Alice in Wonderland, and had the first of many TV specials in 1966, An Evening with Carol Channing. Channing was inducted into the American Theatre Hall of Fame in 1981 and she continues to perform and make appearances, singing songs from her repertoire and sharing stories with fans, cabaret style. She released an autobiography, titled Just Lucky I Guess, in 2002, and Larger Than Life, a documentary film about her career, was released in 2012. Channing was born in Seattle, Washington, on January 31,1921, the child of George and Adelaide Channing Her mother was of German-Jewish descent. Her father was born George Christian Stucker but changed his surname before his daughters birth, a city editor at the Seattle Star, he took a job in San Francisco and the family moved when Channing was two weeks old. He became a Christian Science practitioner and teacher, Channing attended Aptos Junior High School and Lowell High School San Francisco, graduating in 1938. She won the Crusaders Oratorical Contest and a trip to Hawaii with her mother in June 1937. When she was 16, she left home to attend Bennington College in Vermont, and her mother told her for the first time that her fathers mother was African American and his father was German-American. Romeo and Juliet is a tragedy written by William Shakespeare early in his career about two young star-crossed lovers whose deaths ultimately reconcile their feuding families. 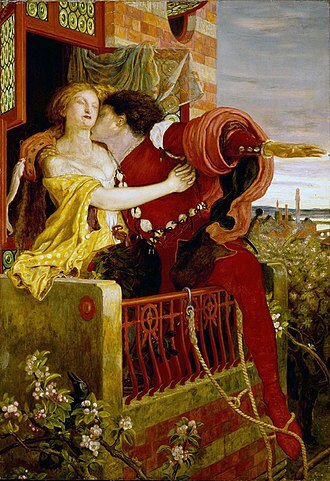 It was among Shakespeares most popular plays during his lifetime and along with Hamlet, is one of his most frequently performed plays, the title characters are regarded as archetypal young lovers. Romeo and Juliet belongs to a tradition of tragic romances stretching back to antiquity. The plot is based on an Italian tale translated into verse as The Tragical History of Romeus and Juliet by Arthur Brooke in 1562, Shakespeare borrowed heavily from both but expanded the plot by developing a number of supporting characters, particularly Mercutio and Paris. 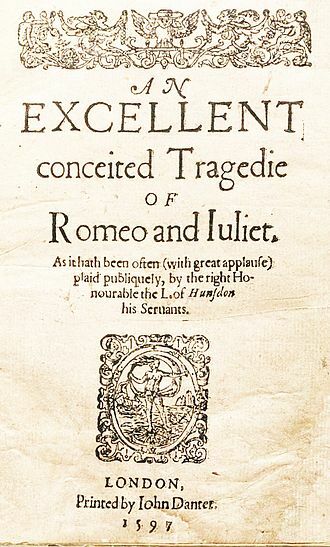 Believed to have written between 1591 and 1595, the play was first published in a quarto version in 1597. The text of the first quarto version was of quality, however. Shakespeares use of his dramatic structure has been praised as an early sign of his dramatic skill. The play ascribes different poetic forms to different characters, sometimes changing the form as the character develops, for example, grows more adept at the sonnet over the course of the play. Romeo and Juliet has been adapted numerous times for stage, musical, during the English Restoration, it was revived and heavily revised by William Davenant. David Garricks 18th-century version modified several scenes, removing material considered indecent, Performances in the 19th century, including Charlotte Cushmans, restored the original text and focused on greater realism. John Gielguds 1935 version kept very close to Shakespeares text and used Elizabethan costumes, the play, set in Verona, begins with a street brawl between Montague and Capulet servants who, like their masters, are sworn enemies. Prince Escalus of Verona intervenes and declares that further breach of the peace will be punishable by death, Count Paris talks to Capulet about marrying his daughter Juliet, but Capulet asks Paris to wait another two years and invites him to attend a planned Capulet ball. Lady Capulet and Juliets nurse try to persuade Juliet to accept Pariss courtship, Benvolio talks with his cousin Romeo, Montagues son, about Romeos recent depression. Weehawken is a township in Hudson County, in the U. S. state of New Jersey. The name Weehawken is generally considered to have evolved from the Algonquian language Lenape spoken by the Hackensack, three U. S. Navy ships have been named for the city. 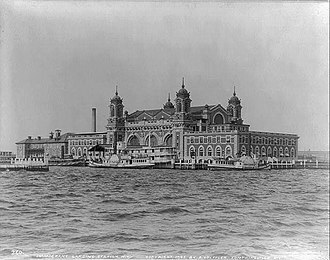 The Weehawken was the last ferry to The West Shore Terminal on March 25,1959, at 1,10 am, Weehawken Street in Manhattans Greenwich Village was the site of a colonial Hudson River ferry landing. The name and the place have inspired mention in works of popular culture. 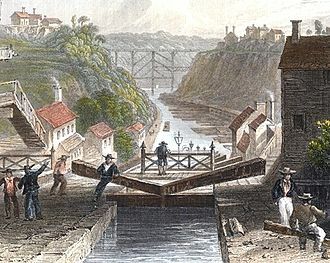 Weehawken was formed as a township by an act of the New Jersey Legislature, on March 15,1859, from portions of Hoboken, a portion of the township was ceded to Hoboken in 1874. Additional territory was annexed in 1879 from West Hoboken, at the time it was the territory of the Hackensack and Tappan, of the Turtle Clan, or Unami, a branch of the Lenni Lenape. 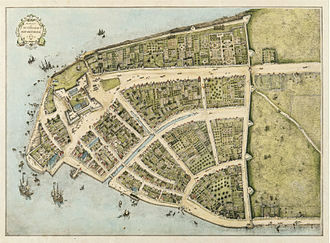 They were displaced by immigrants to the province of New Netherland, on May 11,1647, Maryn Adriansen received a patent for a plantation at Awiehaken. In 1661, Weehawken became part of Bergen when it came under the jurisdiction of the court at Bergen Square, in 1674, New Netherland was ceded to the British, and the town became part of the Province of East Jersey. John Luby, in 1677, acquired several parcels comprising 35 acres along the Hudson, most habitation was along the top of the cliffs since the low-lying areas were mostly marshland. Descriptions from the period speak of the foliage and forests and excellent land for growing vegetables. 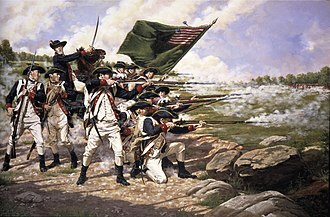 As early as 1700 there was regular, if sporadic ferry service from Weehawken, during the American Revolutionary War, Weehawken was used as a lookout for the patriots to check on the British, who were situated in New York and controlled the surrounding waterways. Early documented inhabitants included a Captain James Deas, whose stately residence at Deas Point was located atop a knoll along the river, lafayette had used the mansion as his headquarters and Washington Irving came to gaze at Manhattan. Not far from Deas was a ledge 11 paces wide and 20 paces long and this ledge, long gone, was the site of 18 documented duels and probably many unrecorded ones in the years 1798–1845. Peter Pan is a musical adaptation of J. M. Barries 1904 play Peter Pan and Barries own novelization of it, Peter and Wendy. The music is mostly by Mark Moose Charlap, with music by Jule Styne. The original 1954 Broadway production, starring Mary Martin as Peter and Cyril Ritchard as Captain Hook and it was followed by NBC telecasts of it in 1955,1956, and 1960 with the same stars, plus several rebroadcasts of the 1960 telecast. In 2014, the musical was broadcast on NBC featuring several new numbers, the show has enjoyed several revivals onstage. Several productions of Peter Pan were staged early in the 20th century, starting in London in 1904, starring Nina Boucicault as Peter and on Broadway in 1905, starring Maude Adams. Producer Edwin Lester and director of the Los Angeles Civic Light Opera, in this ending, Peter returns after many years to take Wendy back to Never Never Land for spring cleaning. He finds that he has been away so long that Wendy is now an adult, despondent at first, he is delighted when Wendys daughter Jane offers to be his new mother, and instead takes her with him. The musical premiered at the Curran Theatre in San Francisco on July 19,1954, the initial four-week run was followed by an eight-week engagement in Los Angeles. The show opened on Broadway on October 20,1954 at the Winter Garden Theatre for a limited run of 152 performances. The busy 1954 Broadway season included The Boy Friend, Silk Stockings, the revised score and Tony Award-winning performances by Martin and Cyril Ritchard made the musical a critical success, and tickets sold out throughout the Broadway run. The show closed on February 26,1955 to prepare for the television broadcast, a Broadway cast album was made of the songs, and it is still in print today. In 1954, Fred Coe, production manager for NBC in New York, began producing Producers Showcase, one aim of the series was to broadcast expensive color spectaculars to promote the new color television system developed by NBCs parent company RCA. On March 7,1955, NBC presented Peter Pan live as part of Producers Showcase as the first full-length Broadway production on color TV, the show attracted a then-record audience of 65-million viewers, the highest ever up to that time for a single television program. Eleanora Fagan, professionally known as Billie Holiday, was an American jazz musician and singer-songwriter with a career spanning nearly thirty years. Nicknamed Lady Day by her friend and music partner Lester Young, Holiday had a influence on jazz music. Her vocal style, strongly inspired by jazz instrumentalists, pioneered a new way of manipulating phrasing and she was known for her vocal delivery and improvisational skills, which made up for her limited range and lack of formal music education. There were other singers with equal talent, but Holiday had a voice that captured the attention of her audience. After a turbulent childhood, Holiday began singing in nightclubs in Harlem, where she was heard by the producer John Hammond and she signed a recording contract with Brunswick Records in 1935. Collaborations with Teddy Wilson yielded the hit What a Little Moonlight Can Do, Throughout the 1930s and 1940s, Holiday had mainstream success on labels such as Columbia Records and Decca Records. By the late 1940s, she was beset with legal troubles, after a short prison sentence, she performed a sold-out concert at Carnegie Hall, but her reputation deteriorated because of her drug and alcohol problems. Her final recordings were met with mixed reaction to her voice but were mild commercial successes. Her final album, Lady in Satin, was released in 1958, Holiday died of cirrhosis of the liver in 1959. A posthumous album, Last Recording, was released following her death, much of Holidays material has been rereleased since her death. She is considered a performer with an ongoing influence on American music. She is the recipient of four Grammy awards, all of them posthumous awards for Best Historical Album, Holiday herself was inducted into the Grammy Hall of Fame in 1973. Lady Sings the Blues, a film about her life, starring Diana Ross, was released in 1972, Eleanora Fagan was born on April 7,1915, in Philadelphia, the daughter of Sarah Julia Sadie Fagan and Clarence Holiday, an unmarried teenaged couple. King Mongkut (far right) with his heir Chulalongkorn seated next to him and some of his other children. A wife is seated at left. 2005 Kennedy Center Honorees Julie Harris, Robert Redford, Tina Turner, Suzanne Farrell, and Tony Bennett, with President George W. Bush and First Lady Laura Bush, in the Blue Room at the White House, December 4, 2005. 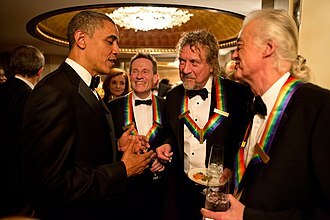 The surviving members of Led Zeppelin were honored in 2012 and are pictured here with President Barack Obama. Kennedy Center honorees 2009 Mel Brooks, Dave Brubeck, Grace Bumbry, Robert De Niro, and Bruce Springsteen, with President Barack Obama and First Lady Michelle Obama in the Blue Room, White House, December 6, 2009. The name of the city's first high-rise condominium tower, the Thread, invokes its historical association with the embroidery industry. Young Balanchine, pictured in the 1920s. 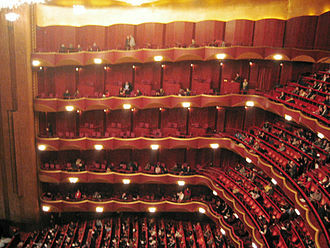 Architect Philip Johnson designed the New York State Theater to Balanchine's specifications. "Portrait of Billie Holiday and Mister, Downbeat, New York, N.Y., ca. Feb. 1947". Hermes Ingenui (Vatican Museums), Roman copy of the 2nd century BC after a Greek original of the 5th century BC. Hermes wears kerykeion, kithara, petasus (round hat), traveler's cloak and winged temples. 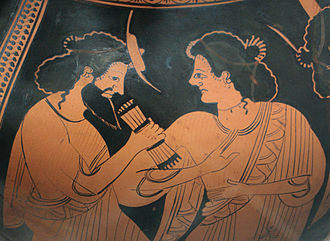 Hermes with his mother Maia. Detail of the side B of an Attic red-figure belly-amphora, c. 500 BC. 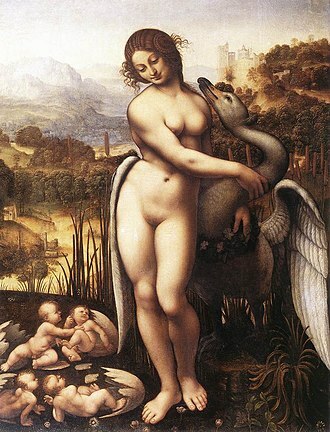 Leda and the Swan by Cesare da Sesto (c. 1506–1510, Wilton). The artist has been intrigued by the idea of Helen's unconventional birth; she and Clytemnestra are shown emerging from one egg; Castor and Pollux from another. 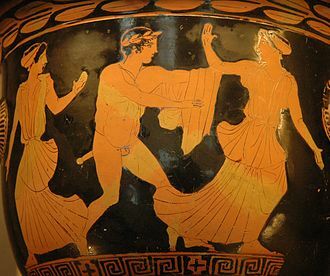 Theseus pursuing a woman, probably Helen. Side A from an Attic red-figure bell-krater, c. 440–430 BC (Louvre, Paris). In this painting by Maarten van Heemskerck Helen, queen of the Greek city-state Sparta, is abducted by Paris, a prince of Troy in Asian Minor. 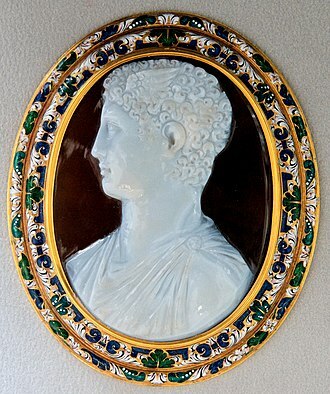 The Walters Art Museum. Igor Stravinsky with Vaslav Nijinsky in costume for Petrushka. L'ultimo bacio dato a Giulietta da Romeo by Francesco Hayez. Oil on canvas, 1823. Title page of Arthur Brooke's poem, Romeus and Juliet. Brando as Emiliano Zapata in a trailer for the 1952 film Viva Zapata! 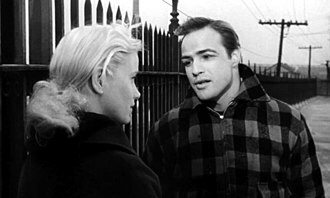 Brando with Eva Marie Saint in the trailer for On the Waterfront (1954). The handprints of Coca in front of Hollywood Hills Amphitheater at Walt Disney World's Disney's Hollywood Studios theme park. With Don Murray in The Rose Tattoo (1951).